Wild hogs (Sus scrofa), a non-native species in North America, cause extensive damage to ecological systems and human infrastructure. Their aggressive rooting degrades habitat. Wild hogs (Sus scrofa), a non-native species in North America, cause extensive damage to ecological systems and human infrastructure. Their aggressive rooting degrades habitat, and they prey on (and compete with) native species. Specifically, wild hogs reduce—and even extirpate—the following: the habitation of herbaceous plant species, the presence of seedlings and saplings of canopy and mid-canopy species, the abundance of soil invertebrates and amphibians, and the reproduction of ground-nesting birds and reptiles through the consumption of eggs. Habitat damage is most pronounced in wet environments, and the wild hogs’ continued presence in freshwater and marsh systems degrades water quality. The soil disturbance causes soil erosion and damage to dirt roads and dikes. The wild hogs also alter the soil integrity surrounding the island’s archaeological sites. Additionally, wild hogs carry at least 30 significant viral and bacterial diseases, many of which can infect wildlife and humans. 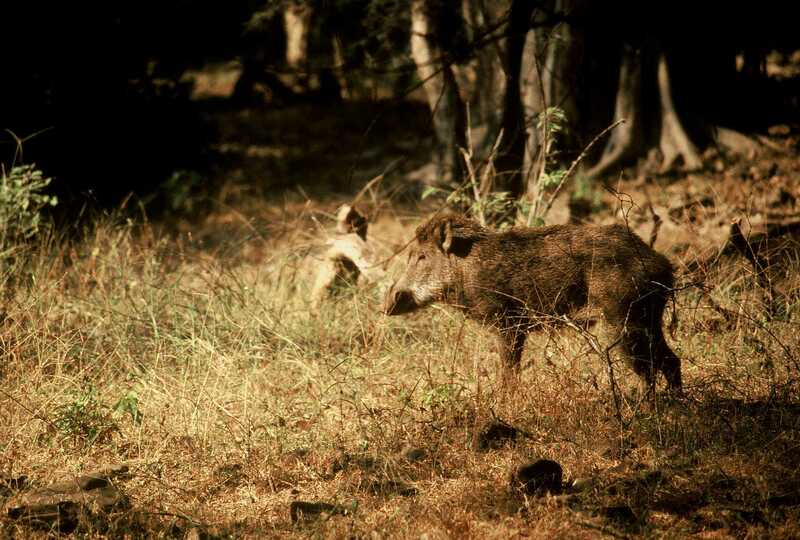 Wild hogs are most abundant in the southeastern United States, California, and Oregon. They are habitat generalists, have a low natural mortality rate, and the highest reproductive potential of any mammal in North America. Uncontrolled, wild hogs can dramatically increase in population size in short time frames. 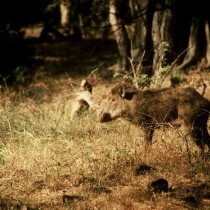 In 2011, wild hog damage to agriculture and conservation areas in Georgia was estimated at $57 million. The state and the USDA actively provide control efforts, with a greater emphasis on barrier islands due to the presence of sea turtle nests. The Georgia Department of Natural Resources coordinates wild hog control on public lands and offers technical guidance for private landowners. Wild hogs impact every ecological system on the island, with the most damage occurring in the upland depression wetland communities, maritime live oak and hickory forests, and marsh communities. Their rooting is frequently evident in these focal resources. Wild hogs especially affect sea turtles and shorebirds since they consume the eggs of these rare species. While wild hogs harm other Georgia barrier islands more extensively, the level of damage on St. Catherines Island appears to be increasing. The removal of wild hogs in the past has kept the population at relatively low levels, but population numbers are increasing and will continue to increase dramatically if not controlled. Source: A Strategic Conservation Plan for St. Catherines Island, Georgia, Prepared for the St. Catherine’s Island Foundation – Robert D. Sutter, L. Gregory Low, Sara J. Gottlieb, June 2013.